Western blot analysis of extracts from various cell lines using Phospho-Rpb1 CTD (Thr4) (D7L9W) Rabbit mAb. 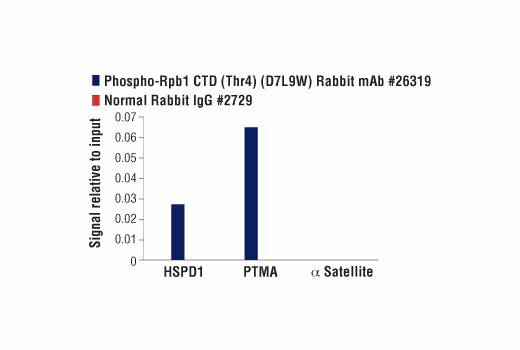 Chromatin immunoprecipitations were performed with cross-linked chromatin from Raji cells and either Phospho-Rpb1 CTD (Thr4) (D7L9W) Rabbit mAb, or Normal Rabbit IgG #2729, using SimpleChIP® Enzymatic Chromatin IP Kit (Magnetic Beads) #9003. The enriched DNA was quantified by real-time PCR using human HSPD1 promoter primers, SimpleChIP® Human PTMA Downstream Primers #20508, and SimpleChIP® Human α Satellite Repeat Primers #4486. The amount of immunoprecipitated DNA in each sample is represented as signal relative to the total amount of input chromatin, which is equivalent to one. 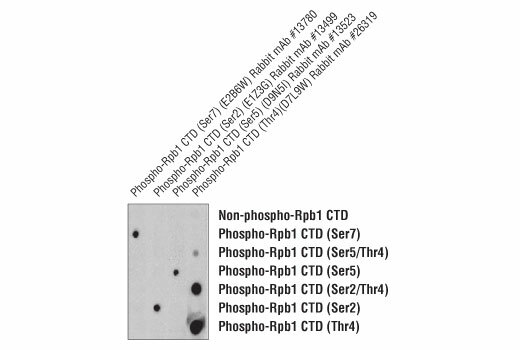 Peptide dot blot analysis demonstrating Phospho-Rpb1 CTD (Thr4) (D7L9W) Rabbit mAb antibody specificity. Antibody binding to pre-coated Rpb1 CTD peptides is shown using Phospho-Rpb1 CTD (Ser7) (E2B6W) Rabbit mAb #13780, Phospho-Rpb1 CTD (Ser2) (E1Z3G) Rabbit mAb#13499, Phospho-Rpb1 CTD (Ser5) (D9N5I) Rabbit mAb #13523, and Phospho-Rpb1 CTD (Thr4) (D7L9W) Rabbit mAb. 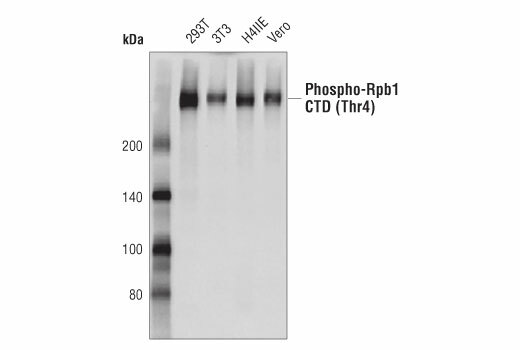 As expected, the Phospho-Rpb1 CTD (Thr4) (D7L9W) Rabbit mAb only binds to phospho-Rpb1 CTD peptide when phosphorylated at Thr4. Phospho-Rpb1 CTD (Thr4) (D7L9W) Rabbit mAb #26319 recognizes endogenous levels of Rpb1 only when the carboxy-terminal domain (CTD) heptapeptide repeat [Tyr1, Ser2, Pro3, Thr4, Ser5, Pro6, Ser7] is phosphorylated at Thr4. This antibody does not cross-react with Rpb1 CTD phosphorylated Ser2, Ser5, or Ser7. Monoclonal antibody is produced by immunizing animals with a synthetic phosphopeptide corresponding to residues surrounding Thr4 of human Rpb1 CTD heptapeptide repeat. Phosphorylation of the Rpb1 CTD heptapeptide repeat at Thr4 is highly conserved from yeast to mammals. However, research studies using Thr4 phosphorylation-mutant Rpb1 proteins suggest different roles for this modification among species. While phosphorylation of Thr4 in yeast is not essential (16,17), Thr4 mutants in chicken and mammalian systems result in RNA processing errors and global defects in RNA elongation (18,19). Threonine 4 is directly phosphorylated by polo-kinase3 (PLK3) and cyclin dependent kinase-9 (CDK9) activity is thought to either directly or indirectly lead to the phosphorylation of this site (18,19). Schwer, B. et al. (2014) Proc Natl Acad Sci U S A 111, 4185-90.